Jerry Garcia (1942-1995) created an unparalleled legacy across the American landscape, most notably in his role as a founding member, singer, songwriter and lead guitarist of the Grateful Dead. Garcia’s unmistakable guitar tone enchanted multitudes of “Deadheads” throughout the band’s 30-year career and beyond. His work with the Jerry Garcia Band, Old and in the Way, Legion of Mary, Garcia/Grisman and projects with Merl Saunders only scratch at the surface of his musical influences as he set out to master the Great American Songbook. Unequivocally devoted to the craft of music, Garcia continues to inspire future generations through the body of work he has left behind and his creative spirit. Ten years after the Grateful Dead ceased touring, Jerry Day ATL organizers Lewis “gr8FLdüde” Newmark and “Row” Jim Roe had been lamenting about the lack of a cohesive Grateful Dead experience in N.Georgia and decided to do something about it. In 2007, they put together the first Jerry Day ATL event. 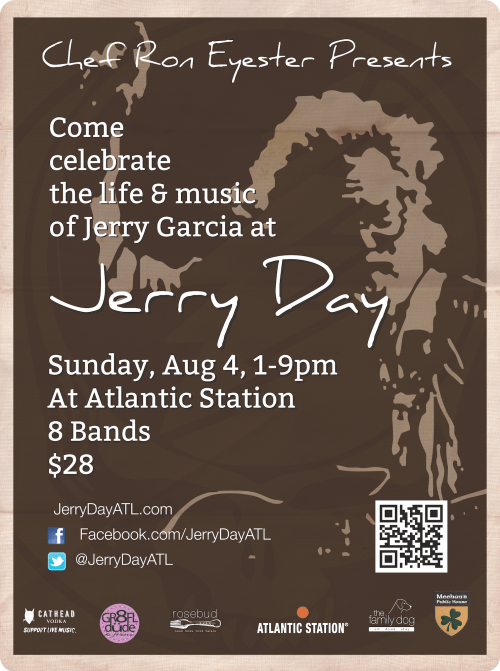 Six years later and bigger and better than ever, Jerry Day ATL returns! The event will take place at Atlantic Station on Sunday, August 4 from 1 pm until 9 pm. There will be 8 local Atlanta bands playing between 2 different stages in honor of the man himself, Mr. Jerry Garcia. There will be local food featuring Meehan’s Public House and other fine establishments open for business in Atlantic Station. A limited amount of pre-sale tickets are being sold for $28 per person general admission (including tax + svc fee) and include one (1) free VIP pass that will allow access to special TBA activities! Tickets may be available on the day of the event for $35 per person on a cash only basis. Grab your tickets now to celebrate the incredible life and music of Jerry Garcia!